Do Flu Immunizations Really Protect You? Getting a flu shot every year is the best way to protect yourself from getting the flu. But last year, only 56.6 percent of children aged 6 months through 17 years got their shot, and only 41.5 percent of adults aged 18 and older. The reasons vary among those who refrain from getting flu shots. They may claim they never get the flu, or they got the flu from the vaccination, or they just don't believe flu shots will protect them. According to the Centers for Disease Control (CDC), everyone 6 months old and older should get a flu vaccination. Vaccinations need to be taken before a person is exposed to the flu virus. Without flu vaccinations, the CDC reports that an estimated 5 percent to 20 percent of Americans catch the flu, resulting in 200,000 hospitalizations, 20,000 of which are children under the age of 5. Flu vaccinations can reduce illness from the flu by as much as 60 percent. Everyone from age 6 months and older, according to the CDC. In addition, there is a high-dose flu shot for people aged 65 and older. Although older people often have weaker immune systems for which the vaccine may be less effective, older people and people with chronic illnesses are encouraged to get the flu vaccine for protection against flu viruses. How is the vaccine administered--do I have to get a shot? 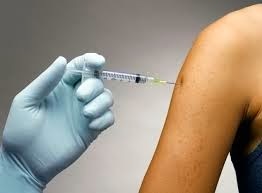 The good news on flu vaccinations is that there are improved methods of administering the vaccine. Smaller needles are used, and there is a nasal spray vaccine that can be used with people age 2 to 49. The other good news is that, although flu strains each year are unpredictable, the latest vaccines provide protection against four flu strains, compared to the previous three.